Growing Southern | Garden Blog: Rain, Rain, come this way! Isn't it odd when you start actually wishing for a rainy day? It's not that I really mind hauling the hose around the yard; I actually enjoy the excuse for time spent with my plants, and it's not so difficult to find the time now that my daughter can tag along. But there's a limit to what you can do (or are willing to do) with supplimental watering. I'm against watering lawns, and it shows. And I was looking forward to juicy tomato-basil sandwitches, but we're raising nothing but cherry tomatoes, and that's not the seeds I sowed! You sound a bit like me! I've never been an outdoorsy person, but I'm enjoying my time outside watering my plants by hand. 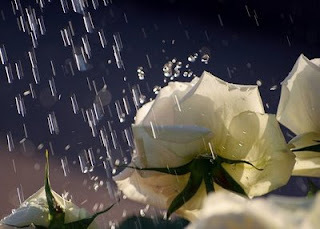 I also look forward to the rain because I think a good dousing every once in a while is good for the plants. Did you say you are having trouble with your tomato plants? My neighbor seems to be having the same trouble. She planted Better Boy and Early Girl but they all seem to be ripening before they grow to full size. She's ending up with cherry tomatoes, too :-). Any idea what causes that? It can a chore sometimes having to water the garden a couple of times a day and rain is a welcome relief but the last few weeks it has rained so hard and often I wish it was nice enough to get out and water the garden. Come back sun. I'm glad to know I'm not the only one hoping for rain. I just planted a liriope groundcover, and it is in desperate need of some moisture.